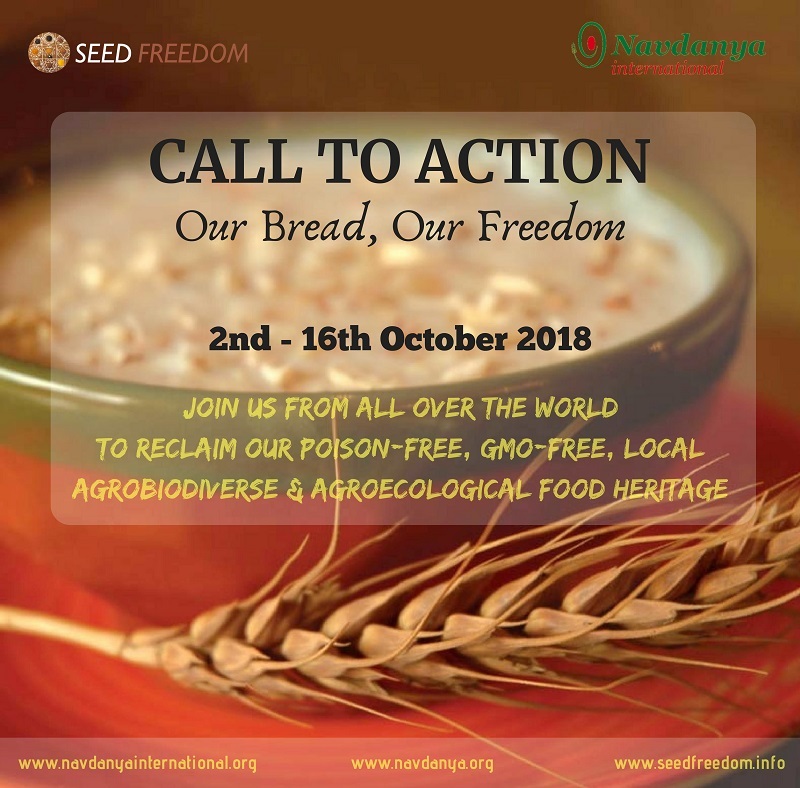 Amidst the heated context that India finds itself in with regard to the farmers’ crisis, the recent farmers’ protests, corporations hijacking our food supply, and an attack on diversity, freedom, democracy and peace, it becomes an act of resistance to celebrate the gifts that Mother Earth provides. In an atmosphere of joy, laughter, colour, reunion and love, women from all over India and other parts of the world gathered at Navdanya Biodiversity Conservation farm to celebrate Diversity and Freedom, along with women’s movements Mahila Anna Swaraj and Diverse Women for Diversity. Mahila Anna Swaraj, Navdanya’s programme for women’s food sovereignty, is based on celebrating and rejuvenating women’s knowledge and skills in biodiversity conservation, sustainable agriculture and food production, and in artisanal organic food processing. The event kicked off with the opening conference, where the guiding principles of the women’s movements for diversity were underlined, as a way to another future for the health of the planet and our health, based on diversity, including the diversities of our intelligence and knowledge, of our economies and democracies. Dr Vandana Shiva, President of Navdanya and forerunner of the movement, Diverse Women for Diversity (DWD), stressed how this gathering is the continuation of an ongoing process: “Following the People’s Assemblies around the world, this is democracy in action. People are taking a stand and shaping the future of our food, our agriculture and the planet and we are here to celebrate Diversity, in a moment when it’s criminalised and under attack”. Speaking of the important role of women, Beth Burrows, one of the founders of DWD, declared: “The future is female. If the future is female, it will always be fertile and we will share it together. We discovered that we were feeling the need for more connection. We decided to start a worldwide project to bring all of us in our diversity together for a common purpose, to find ways to organise against the forces which are transforming the globe into a new world order where diversity and justice will be by products”. Christine Von Weizsacker also a forerunner of DWD, said: “Diversity is nowadays about observing nature and learning from each other and mostly about friendship without borders; Diversity of seeds is only safe with communities at the local level”. Mira Shiva recalled that the western corporations are making us into zombies just obeying and blindly accepting junk and processed food as real food with real nutrition: “Most of FDI in developing countries goes into corporate processed food which is more poison and less nutrition. This is a theft of our health and humanity. We need to be a force for action for our own future”. Dr. Janak McGilligan, who has been empowering women communities on the ground for decades, said: “True sustainability comes from love, unity and friendship. We cannot poison what we love. Let us not pollute our souls”. Sarita Kumari, a seedkeeper, an organic farmer and founder of Ghanerao Foundation, said: “All the learning is already here. It is time to spread the message”. Reflecting the sentiment of Vasudaiva Kutumbukham (Earth Family), communities from various states of India along with Brazil, Japan and Europe, celebrated their seeds, Seeds of Freedom, by planting them in a “Garden of Hope”. Confirming our common commitment to grow and nourish these seeds on our farms, our gardens, our balconies and our terraces, these Seeds of Freedom are also symbolic of a future where we grow our own food, shape our own nutrition, cultivate real food, real health and real communities. The campaign “Our Bread, Our Freedom” was launched afterwards with all groups of women preparing traditional breads and foods in a triumph of colours, flavours and aromas. Pita bread from West Bengal, Ragi Mudde from Jharkhand, and a number of delicious dishes cooked by others from Ladakh, Orissa and other states. Diversity not solely being about food, the day ended with a few traditional songs and dances performed by the various participants in the conference. 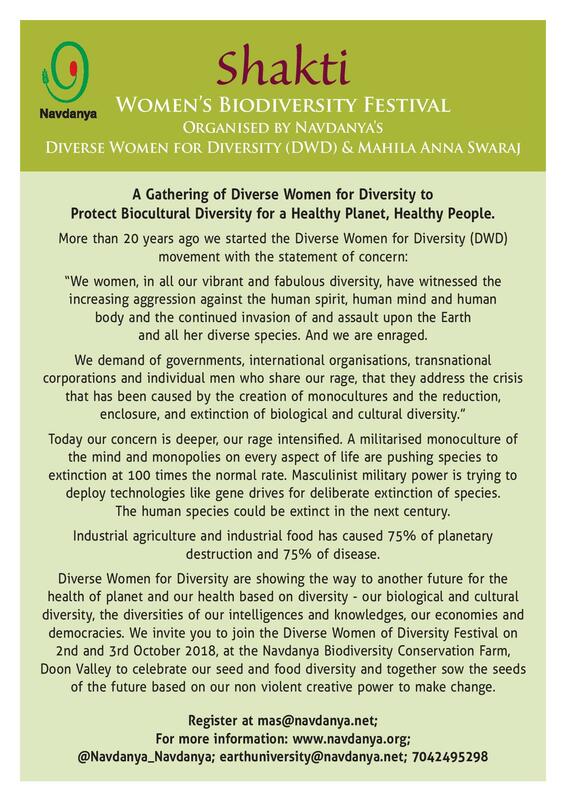 The second day of the Women’s Biodiversity Festival at Navdanya Biodiversity Conservation farm started with a panel with representatives women’s movements for diversity of the world in front of an audience of women and farmers from 25 regions in India and other parts of the world. The discussion revolved around issues and strategies on Seed and Food Sovereignty in Women’s Hands, as well as on how to capitalize on more than 20 years of shared knowledge about Biodiversity, corporate attempts to take-over our seeds, food and health. But also on new threats, such as new GMO technologies like gene drives, as well as on the solutions offered by Organic Farming, Organic Processing & Organic Distribution. Diverse groups, according to diverse states and countries, examined details of diversity of crops and foods in their regions, and strategies on how to protect traditional food to be able to make a transition in the next ten years. At the end of the conference, the Diverse Women of the World Resolve to Defend Biological and Cultural Diversity through Non-violence was released. Through this declaration women celebrate the shift from monocultures to diversity, from the paradigm of violence against the earth and our bodies to a paradigm of non-violence in food and agriculture, through protecting the biodiversity of our seeds, our foods, our knowledges, our cultures, our economies. Beth Burrows, co-founder of Diverse Women for Diversity movement, reminded the audience that “unfortunately, the assault on the planet, seeds, farmers, science and of course women and biodiversity is still happening. Fortunately, the line of women is getting much longer and less thin. Now the line contains ecology and great diversity occupying every niche of the political system”. She also talked about the problem of biopiracy: “Sometimes seed savers are approached by subjects who offer to ‘help’. This is how the theft of other people’s biodiversity and the knowledge of how to use it takes place. Be careful who you give yours seeds and your data to”. Christine Von Weizsacker, also a forerunner of DWD, highlighted the importance of understanding the new threats we are facing. “Understanding is taking a stand”, she said, referring to what’s happening within genetic engineering – gene editing, gene drives and CRISPR cas9 technology. She also pointed out the importance of the precautionary principle, as well as the ‘polluters-pay’ principle, which are desgned to protect people and nature, and that are strongloy opposed by corporations, as they interfere with their profits and interests. In this perspective the importance of independent science is crucial. Debbie Barker, member of Navdanya International board and former co-director of the International Forum on Globalization (IFG) talked about the farmers’ crisis in the United States: “When farmers do not do well, your culture, society & political dynamism is also destroyed. When small businesses are closing due to small farmers being destroyed, the whole community is also destroyed This happens in the USA, in India & in every society. Industrial agriculture is based on the assumption that we have limitless supply and limitless consumerism. Instead of living in the bounds of nature and working with nature, industrial agriculture has an aggressive ‘nature’s conqueror’s’ approach. The political system in the USA has neglected farmers’ rights for so many decades that they choose to vote in an angry way”. She concluded that “The way forwards is small farmers and saving seeds is the way of the future”. Dr Rashimi talked about the problem of corporate imported commodities dumped on countries like India and replacing tradtional oils, pulses, salt and sugar. “We don’t need any technology and processing, oil can be made with eco friendly cold press technology. If you’re confused, just follow what our grandmothers did and ask questions on indigenous knowledge and share them with your children”. As also researchers and scientists are being paid by big companies, she said”No, I will plant my own seeds, I won’t listen to the experts”. Marilyn McHugh, co-founder of The Hummingbird Project, soil scientist and teacher a t Navdanya’s Earth University declared: “Women bring life into the world, we must care for the Earth and the tiniest creatures in the soil. Together we can help rebuild the system Mother Nature has created while providing food, beauty and health for generations to come”. Dr Janak told the audience how, after her battle with cancer she went into battle against plastic and solar cooking with her husband as she “could not let Mother Earth get cancer too”. Sarita, who works with 15’000 women, generating income and employment through indigenous knowledge and art, said: “As women we can fight for each other because we can understand each other so well. It’s girls and sisterhood that’s going to carry forth”. Dr Vandana Shiva, addressing the women there, declared: “Gandhi didn’t give us our freedom, he merely reminded us that we were free all along. We are our own freedom fighters, individually and in unity”. She also asked women to make an action plan towards poison-free food and agriculture for the 3, 5, 10, and 30 years, in order to move forward in their own respective regions, “so that no farmer should committee suicide ever again”, and in doing that: “We need love, we need friendship, we need unity, we need freedom”. In the afternoon a tree planting ceremony took place. Trees were planted to honour friends who worked for biodiversity and freedom who passed away. Dr Vandana Shiva said: “Their passing away means we renew our commitment so we plant trees”. One Mango was Tree planted for Janak’s mother, as yearly tradition on her birthday, one Jack fruit tree was planted for Kent Whealey and one Moringa tree was planted for Wendell Berry. 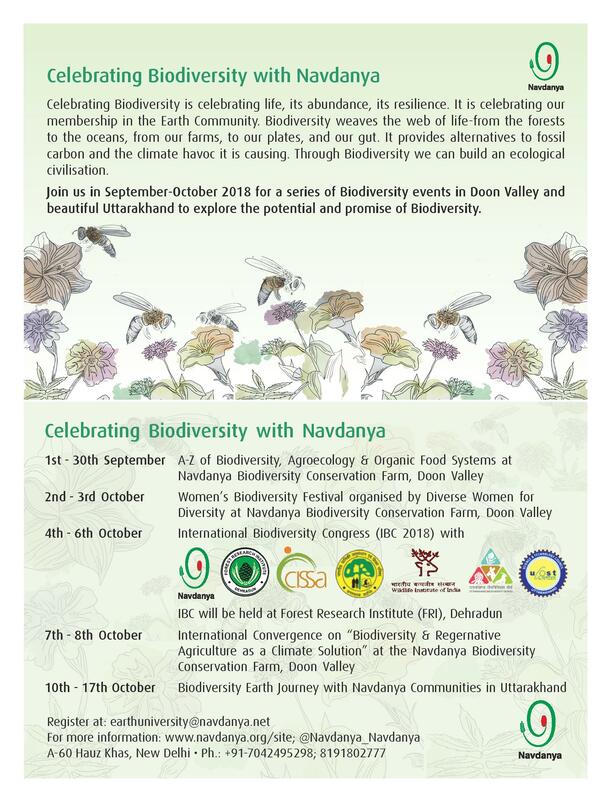 The next important event co-organised by Navdanya is the International Biodiversity Congress, which is going to take place from 4 – 6 October in Dehradun. The Congress is being organised as a joint initiative of Navdanya, Centre for Innovation in Science and Social Action (CISSA), Indian Council of Forestry Research and Education (ICFRE), Wildlife Institute of India (WII), Uttarakhand Biodiversity Board and Uttarakhand Council for Science and Technology, with the support of various international and national governmental and non-governmental organisations. It will bring together leading scientists and academics, legal experts, civil society organisations, institutional and governmental representatives at local, national and international level. Central focus of the main topics will be “Biodiversity for Ecological Civilization” and will include: biodiversity and planetary health, the biodiversity crisis, biodiversity for a sustainable future, biodiversity of knowledge systems and biodiversity of economies. Barja is the symbol of resilience for the Rajasthani women. At Navdanya Biodiversity Conservation Farm, diverse breads will be baked from diverse wheat varieties. There will be a screening of an abstract of the documentary “Pani del Mondo” (Breads of the World), by Alberta Pellacani. As part of a participatory art project, this video is the storytelling and sharing of what is the value of food, work and wisdom for women migrants. It tells how practice and values are passed to new generations simply through practice and imitation, as well as how bread-making helps maintaining connection bridges with the countries of origin and supports and mitigates the difficulties of integration. 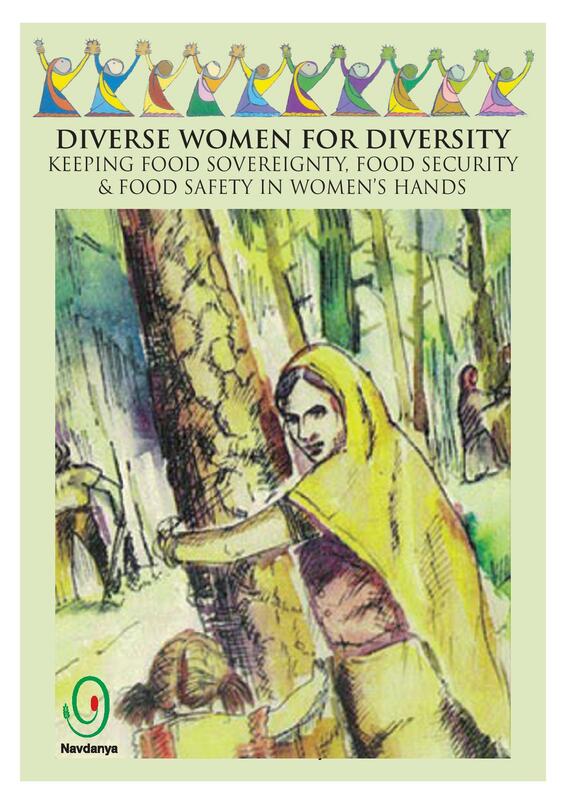 No Comments to "Women’s Biodiversity Festival & Launch of “Our Bread, Our Freedom” Campaign"